I have been asked to make, occasional, contributions to this blog from the standpoint of someone who has done some running and looking at Geraldine and saying "What the hell are you doing?" No, of course I won't be like that. I will be supportive and encouraging...as soon as she does something to warrant this involvement. Geraldine is taking on quite a task. From nothing to 10k in just over 3 months. 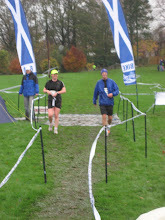 As Race Control of the West Highland Way Race (God Bless it!) she has seen what happens to runners. She has seen the destruction of body and mind. She has heard the tales of misery and toil. She has smelled (smelt?) the disgraceful body odour. And yet, she is willing to take it on herself. What a girl! I hope everyone else is going to get behind her and support her right the way through to the finish line. Well done Mr Coach, you've encouraged another lamb to the slaughter. There's something very poetic about a joint blog belonging to a Queen and a Princess.